We’re excited to announce another major milestone at MasteryConnect…the launch of our new District Benchmarking product! With MasteryConnect’s District Benchmarking, district administrators can securely and electronically distribute both district-created and publisher content directly to teachers. Benchmarks automatically appear in teacher’s trackers ready to administer to students, saving all the distribution and scoring hassles of the past! Teachers can utilize MasteryConnect’s built-in, time-saving assessment tools (GradeCam bubblesheet scanning, iPod/iPad, and browser-based scoring) to grade the benchmarks right from the classroom giving them immediate data and feedback. Best of all, district benchmark data can be compared with a teacher’s formative data right from the MasteryTracker™. If you’ve used a tool like Google Maps with the ability to “layer” traffic on top of your map, the benchmark comparison feature works in a similar fashion. With one click, teachers can easily “layer” the results from a benchmark right on top of the formative data, making it easy to see changes in the mastery status. With comparative data, teachers can easily track things like student retention or have new discussions and conversations around formative assessment rigor. Your district will need to have premium access to MasteryConnect to add the District Benchmarking tools. If you’re interested in learning about getting started in your district, contact us today! Check out the video demo below to see how it works! Much of the story in education technology is not new. In the 1980’s, an education technology “surge” drove millions of dollars to a market that had been largely untouched by technology and innovation. Today, a new ed surge is happening with a lot of new investment dollars and technologies hitting the market. The surge has been spurred on by a market transition to Common Core standards, and more philanthropic and government money reaching the space. In this continuing saga of education technology (for the purposes of my analogy) the empire is NOT any one company, nor is it the dominance and control of the space by a relatively few players. The empire is everything that is preventing choice for the best applications to be used in the classroom. The empire is the inefficient market that plagues education and prevents efficient purchasing and distribution of the best products available to help teachers and students. While the education field may seem like fertile ground for teacher-friendly innovation, current purchasing practices continue to reward mediocrity. Common practice has been for schools and districts to seek massive solutions (shall we say “death stars”) that check every box and seek to provide one system that attempts to solve all problems. Gravity and the energy field of the purchasing/RFP process takes it there. For example, if a district is looking for a tool to administer formative assessments and provide related data for students and stakeholders, the RFP for such a system might also include requirements to deliver summative assessments, teacher evaluation tools, standards-aligned lesson plans, explicit curriculum mapping tools, behavior management tools, a report card system, a traditional online gradebook, an LMS delivery platform, and on and on….enterprise companies love to check the boxes…it’s what they do…it is what wins RFP’s in the empire. Decision makers are often looking to try and solve many things by writing one large check with the hope of data interoperability within massive systems. This approach effectively eliminates the competition and allows the vendor to charge more for a huge array of mediocre solutions. In the race to “do more,” focus and attention on doing things well or innovating with new approaches to the problem are often tossed to the curb. The result is too often a bloated software system that lacks innovation and a user-interface too difficult for teachers to navigate. The proliferation and demand for the development and sales of these massive systems is often unknowingly exacerbated by those who have the intent to do the most good, like those who helped to get money for states through Race to the Top. Case in point…North Carolina was given $400 million in RTT money. Part of the requirements for this one-time money for states as outlined by the Department of Education is that RTT states use part of the millions they’ve been given to build an IIS (Instructional Improvement System). So what did the recent state-wide North Carolina RFP look like? Well, it looked a lot like what I described earlier. It read like one vendor will be awarded to come in and solve all these problems in one monster system. While it is amazing to be at a place now in education technology where these ideas and the problem-set is being outlined and defined, I’m fearful that mistakes of the past with attempts to build such data systems will be repeated with all this new money. As an edtech startup, I believe I can speak on behalf of many other innovators in the space. Our collective hope and plea is for state and other education technology leaders to take a step back, just for a moment, to really think about the system architectures that are about to be built with this $5 billion infusion of RTT money… system architectures that could finally bring choice and innovation to the classroom. This is an exciting time for edtech as new and innovative start-up companies are building amazing cloud-based solutions that are targeted to the specific needs of teachers and students. These companies are agile, responsive, and the tools are user friendly. They are building a loyal following of teachers by offering all or part of their solution to teachers for free, while working to secure funding from school and district leaders seeking to provide their teachers with quality solutions. An interesting part of the North Carolina RFP story is that there was one part of the RFP that gave me hope. In this episode of the edtech story, there is hope that there might actually be a chance for systems to be different, a chance there just might be balance brought to the force. There on page 25 of the 106 page RFP (not including appendices), was the requirement that this massive IIS system be integrated and communicate with the Shared Learning Collaborative (SLC). The SLC is a $75 million dollar Gates-funded project that is being run a team at the Gates Foundation (Shout out to Stephen Coller doing a great job leading the charge), while code is being developed by a 60-person team (shall we call it a clone army?) from Wireless Generation in Durham, North Carolina (A $75 million project to put a rework and build upon on the Ed-Fi standards, not a bad gig when you can get the work). 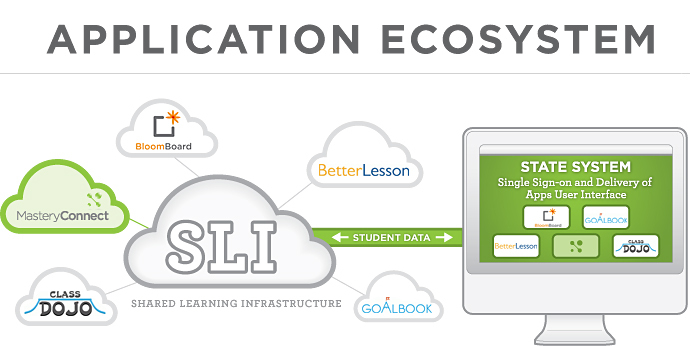 The SLC is a data repository and integration framework that, given it becomes all it promises to be, will allow cloud-based or other solutions to “plug in” to student information and receive relevant information about students to use in an application. The new standard promises a data communication layer to send information about the student (for example, mastery of a Common Core standard) back through to be stored in any system at a school or district. My diagram below illustrates what could be done and modeled in states like North Carolina. For example, if such an architecture were to be adopted, best-of-breed applications and new innovations could be easily plugged into the ecosystem with a common student data communication layer. Teachers/Schools/Districts could make the decision to change out their apps much more quickly, and RFP processes could be dramatically changed. Local schools and teachers could choose MasteryConnect for their formative assessments, BloomBoard for teacher evaluation, BetterLesson for lesson planning, ClassDojo for behavior management, GoalBook for IEP tracking, Engrade for a traditional gradebook, Edmodo for an LMS, and on and on. For many participating in this edtech saga, it sometimes feels like we’ve been at this juncture before, with the early promises and hope for standards, many are asking if this time will be different. In my opinion, this time we are in a much better place. With education technology finally becoming cloud-based and the evolution and emergence of easy-to-implement API’s(application programming interface) and integration tools, I am hopeful that we are close to ending the empire and creating choice for teachers and schools. And the Shared Learning Collaborative isn’t going to be the only game in town for ecosystems. While the SLC is indeed seeking to become the standard, their aspirations are to actually enable more ecosystems based on the standards that are developed. The SLC plans to make everything open source to allow others to build on these new layers and standards. Word on the street is that Pearson (who has made great strides in recent years in opening up more API’s) is thinking along these lines as well, although it remains to be seen if Pearson will choose to embrace the new SLC standards. Companies like Education Elements (a MasteryConnect partner), have been essentially pioneering this model of an ecosystem with their blended platform. Edmodo recently launched an app store for educators (Masteryconnect launched on the new Edmodo platform), a quantum leap forward to providing more choice in classroom technology. New startups are also entering the market around these concepts such as LearnSprout and Clever, and a new market is emerging to help push student data to the cloud to make it more accessible for more ecosystems to thrive. In the end, I go back to the plea to states, CIO’s, and district leaders (maybe in the same tone as Princess Leia saying, “help me Obi Wan Kenobi”), let’s work together to look at system architectures and ecosystems that support getting the best technology and innovation into the classroom. 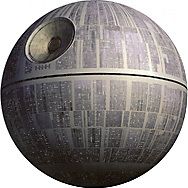 We are on the verge of the next episode…let’s avoid the return of the death star.